Don Bailey goes to Washington in support of fragile X families! Every year, the National Fragile X Foundation holds National Fragile X Advocacy Day in Washington, D.C. On advocacy day, families affected by fragile X meet with their congressmen and talk to them about how fragile X affects their lives. 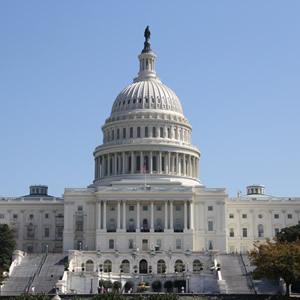 Families encourage their congressmen to support policies that benefit the fragile X community, such as those that affect health insurance coverage or promote fragile X research. Advocacy day is important because lawmakers may not know much about fragile X, and they are more likely to support policies and practices that serve the fragile X community when they can "put a face" on the disorder. Our Fragile X World researcher Don Bailey participates in advocacy day whenever he can. On Monday March 5, he helped train families on how to talk to their congressmen. Then on Tuesday, March 6, he accompanied parents of children with fragile X and self-advocates as they met with congressmen such as David Price (D-NC) on Capitol Hill. Don reported that the day was a success and a great experience. He said, "Getting to interact with families and self-advocates in the fragile X community is one of the most rewarding parts of my professional life. I was happy to help get the word out in Washington about why it's important to continue to fund fragile X research." It is encouraging that lawmakers are hearing the stories of families affected by fragile X, and that government research agencies like NIH have a plan for continuing research on fragile X. At Our Fragile X World, we are excited to be part of research that could improve the lives of families affected by fragile X! Did you participate in this year's NFXF advocacy day? What did you learn and experience? Please consider sharing your story with us.